Paradox Omega has made a commitment to use only marine species caught in designated sustainable fishing grounds in the deep clear waters of the Arctic and South Pacific Oceans. Each softgel capsule contains a unique blend of pure Omega 3 fish oil with powerful polyphenol antioxidants and has no fishy taste. 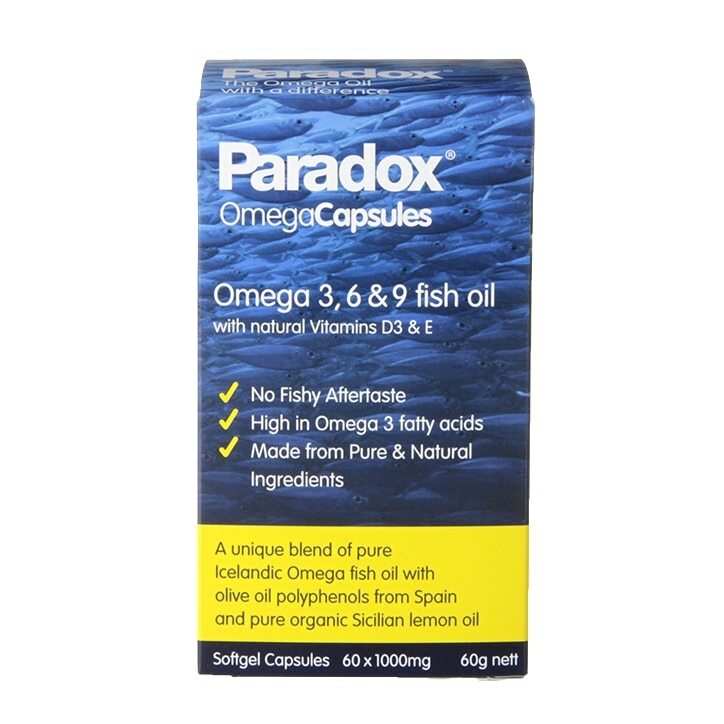 Paradox Omega Capsules contain omega 3,6 and 9 fish oils with natural vitamins D3 and E. These ingredients provide nutritional support for heart, brain, eyes, bone & joints, skin, immune system and general wellbeing. This product contains fish oil. Paradox Omega 3 6 & 9 Capsules 1000mg is rated 4.7 out of 5 by 21. Rated 5 out of 5 by It is me from This is a great product I have used Paradox capsules for several years. If I ever run out of them I feel a loss of energy. They are quite expensive but good value when on offer. Rated 5 out of 5 by Kakou from Doesn’t smell aftertaste fish Good product it doesn’t smell fish I would buy again. Rated 4 out of 5 by sunni gym 3 from time will tell. early days,got to use for 3 months to see any benifit.good points no fishy smell and easy to take. Rated 5 out of 5 by Tilliemint from No aftertaste I have tried other makes of fish oil capsules and even though they have been described as ' no after taste ' there often was . Paradox really doesn't have any aftertaste at all . This make is so much better than others I have tried .